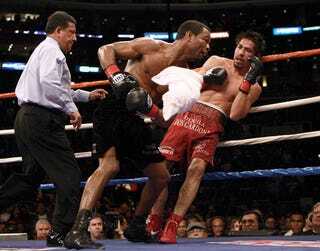 The air of invincibility surrounding Antonio Margarito following his super human performance against Miguel Cotto was brought down 37 year old Sugar Shane Mosley before the largest crowd in Staples Center's history. Mosley, a 3-1 underdog entering the welterweight title fight, was well on his way to a possible shutout win when he caught Margarito in the 8th round with a brutal combination that floored the champ. Margarito's corner unwisely allowed their fighter to come out for the ninth round, despite the fact that he was clearly hurt. Mosley didn't take long to end things in the ninth round marking just the first time the Tijuana Tornado has ever been stopped. While the fight itself went off without controversy, the same could not be said of the pre-fight preparations. Mosley's new trainer Naazim Richardson was in Margarito's locker room to witness the champ's hands being taped when he alerted officials to the presence of an illegal plaster-like substance within the wraps. The case was resolved well in advance of last night's fight, however it certainly raises questions as to what Margarito may have gotten away with in the past, say last year against Cotto for example. As a boxing fan I want to believe that this was an isolated incident, but it's hard to do so when the infraction was so blatant. Mosley has to be thrilled with his choice to fire his trainer/father in favor of Richardson, and not just because of the trainer's keen eye. Richardson, the veteran who has made his name in the corner of fellow Golden Boy employee Bernard Hopkins, will earn a ton of credit for once again preparing an older fighter for an upset over a clear-cut favorite. It's the best Sugar has looked since the last time he won in Staples Center, a win over Oscar de la Hoya that was later marred by admissions of blood doping. Last night's win puts Mosley in the drivers seat of the welterweight division, the deepest and most talented division in boxing today. Undefeated Andre Berto, my own personal mancrush, is still about a year away from a title fight with a guy like Mosley after gutting out an impressive win over Luis Collazo last week. Meanwhile fighters like Manny Pacquiao, Paul Williams, and the "retired" Floyd Mayweather are always lurking on the periphery of the division.